We have several models of skid steer mount, hydraulic drive trenchers available with trenching widths from 6 to 10 inches wide with depths of either 36 or 48 inches. The TN548 series models are offset slightly to the right; the T36 models have a hydraulically powered side shift mounting plate. 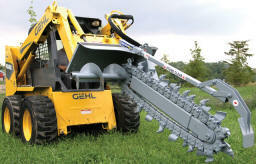 All models are designed for commercial use in trenching of most soil types. Hydraulic Powered Skid Steer Mounted Trencher mounts on standard quick attach compatable skid steer loaders. 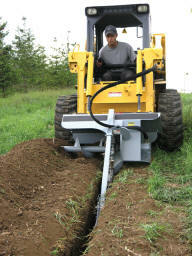 This commercial trencher produces a trench 48 inches deep maximum and 6-10 inches wide depending upon the model. 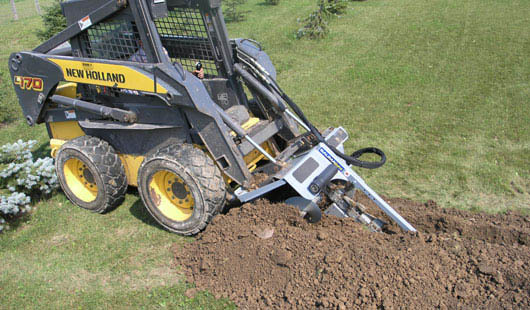 Connects to your skid steer loaders auxilliary hydraulics and requires a skid loader from 40 to 100 engine hp and with a hydraulic system from 11 to 25 gpm. 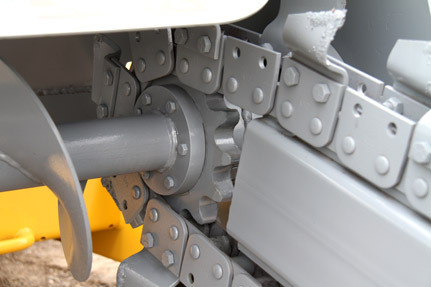 The standard teeth are good for most digging conditions; for severe digging conditions in rocky soil, the unit can also be ordered with a 50/50 rock teeth chain. This unit is a quality product with design features such as a grease cylinder chain tensioning system, and tapered roller bearings in the idler sprocket for longer life. Crumber Scraper Bar helps to scrape and sweep extra dirt and debris into the chain where it is lifted out of the trench. 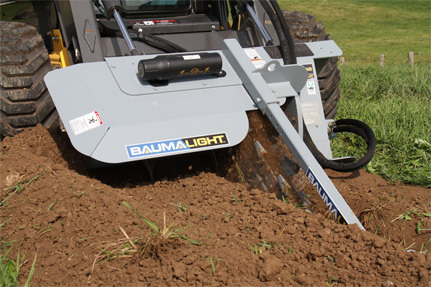 The heavy construction and hinged design mean that the scraper performs no matter what depth of trench you are digging. The hydraulically powered plantetary gearbox provides the power to drive the teeth up to 4 ft. deep, while the large drive gear prevents the chain from getting clogged. 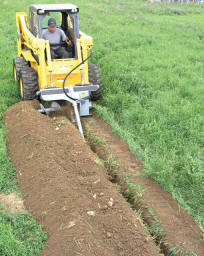 The auger keeps the dirt clear of the trench while digging but close to the trench for easier backfilling. Chain tension is easily adjusted with a couple of pumps of grease by applying grease to an internal cylinder which pushes the roller nose forward; one of the easiest methods of adjusting chain tension ever devised. 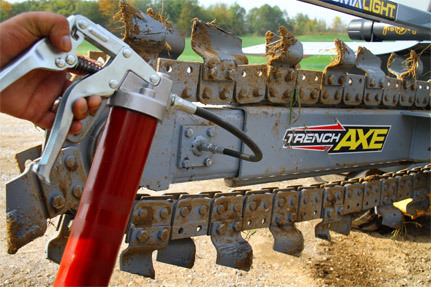 Model WLTN548-6: Trencher with 48 inches long x 6 inches wide standard cup tooth chain (S4806 chain option), wt. is 1250 lbs. - Click the link below for current price on all the models and to go to the order page for each model. Model WLTN548-8: Trencher with 48 inches long x 8 inches wide standard cup tooth chain (S4808 chain option), wt. is 1260 lbs. - Click the link below for current price on all the models and to go to the order page for each model. Model WLTN548-10: Trencher with 48 inches long x 10 inches wide standard cup tooth chain (S4810 chain option), wt. is 1270 lbs. - Click the link below for current price on all the models and to go to the order page for each model. 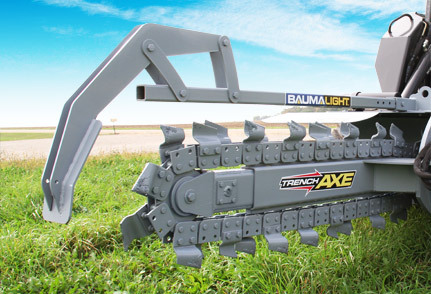 Model WLTN548-6R: Trencher with 48 inches long x 6 inches wide rock and cup tooth chain (M4806 chain option), wt. is 1284 lbs. - Click the link below for current price on all the models and to go to the order page for each model. 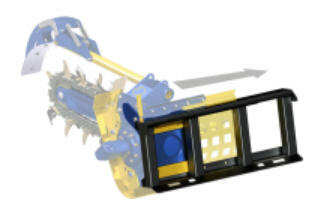 Model WLTN548-8R: Trencher with 48 inches long x 8 inches wide rock and cup tooth chain (M4808 chain option), wt. is 1290 lbs. - Click the link below for current price on all the models and to go to the order page for each model. 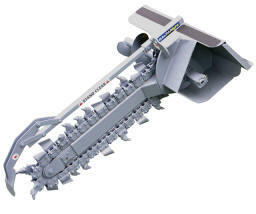 Model WLTN548-10R: Trencher with 48 inches long x 10 inches wide rock and cup tooth chain (M4810 chain option), wt. is 1310 lbs. - Click the link below for current price on all the models and to go to the order page for each model. Order the below accessories with a new unit (see the accessories list on the order page for the Trenchers). 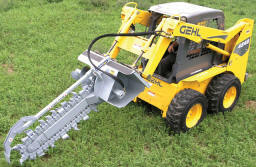 Model WLD001393: Three point hitch adapter (bolt-on), allows mounting of trencher on rear of tractor on three point hitch, wt. is 530 lbs. -Click the link below for current price on all the models and to go to the order page for each model. Model WLS1050: Hydraulic valve kit (for tractors that have only one remote), wt. is 200 lbs. - Click the link below for current price on all the models and to go to the order page for each model. 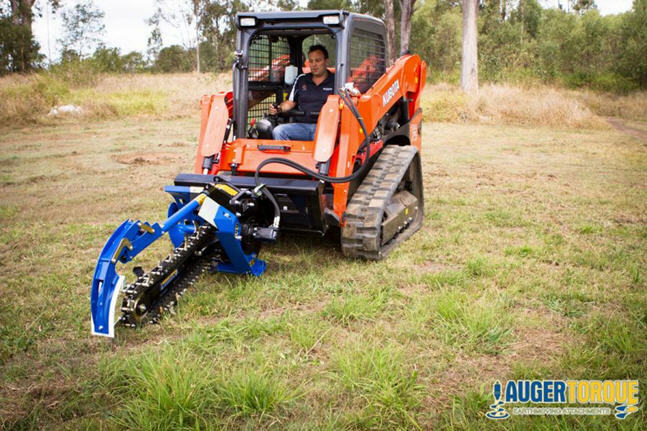 Auger Torque Trenchers are quickly gaining a reputation of being the toughest most versatile units on the market today and are available for a wide range of skidsteers, mini loaders, backhoes and excavators up to 10 tons in weight. Using only the highest quality hydraulic motors that allow flow rates of up to 27 GPM (on the 6 inch wide models shown), and then amplifi ed by Auger Torque’s own ‘bullet-proof’ planetary gearbox means that our trenchers have the reliability you need and the power to ensure your trenching is carried out with ease. 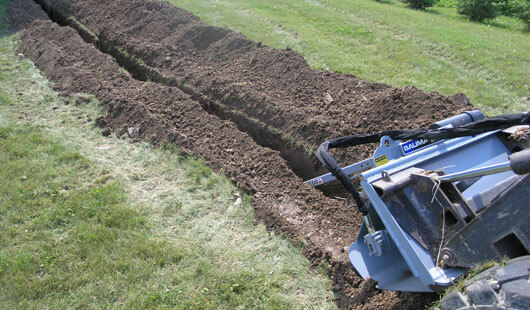 Model MT36-6: Hydraulic trencher with side shift, has trencher chain and bar to trench 6 inches wide and 36 inches deep, requires hydraulic system with 12-27 gpm and includes hoses and couplers and comes standard with frame to fit skid loaders (or telehandlers) that have the universal skid steer quick attach connection on the mounting arm(s), specify make and model of telehandler of you need a different custom mounting frame - Click the link below for current price on all the models and to go to the order page for each model. Model MT48-6: Hydraulic trencher with side shift, has trencher chain and bar to trench 6 inches wide and 48 inches deep, requires hydraulic system with 12-27 gpm and includes hoses and couplers and comes standard with frame to fit skid loaders (or telehandlers) that have the universal skid steer quick attach connection on the mounting arm(s), specify make and model of telehandler of you need a different custom mounting frame - Click the link below for current price on all the models and to go to the order page for each model.